From the beginning Telangana has been contin­ued as a seperate political division in Andhra region. Formerly Satavahanas were also the lords of Deccan. Later they conquered Coastal Andhra region. Abheeras founded their independent nation after the decline of Satavahanas. Initially Telangana was under the control of Royal dynasties of Maharashtra rulers. 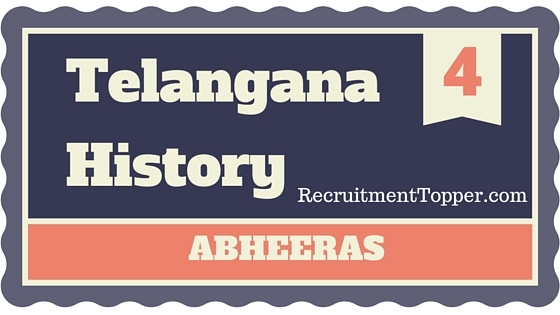 Abheeras acquired Maharashtra along with North Telangana under their sovereignty. Abheeras ruled thfe Deccan region contemporary to Ikshvakus inbetween the years of 250-340 AD. west portion of Nalgonda existed as border for their nations. The literary work “Mahabhashyam” of Patanjali revealed that Abheeras were foreigners and they came India along with sakas from East Iran. This Manuscript grouped Abheeras in Sudras. These Abheeras worked as com­manders in chiefs of Armies under Kshaatrapas in 2nd century. One inscription of Rudradaman dated 181 A.D. mentioned the Army chiefs of Abheeras. The names Bhavaka and his son Rudraboopati were mentioned in that inscription. It looks like that Abheeras worked under Kshaatrapas at first and later served the Satavahanas. Abheeras become feudatories of Satavahanas after taken up again of Maharashtra, Malwa into the hands of Yajnasri Satakami after Rudradaman. They founded independent nation at that region after the downfall of Satavahanas. Mythological literary works reveals that 10 mem­bers of Abheeras were ruled 67 years after Satavahanas. But we know that the name of only one king of Abheeras who ruled North west of Deccan was mentioned by the inscription was Rajamathariputra Eeshwarasena. Historians opined ‘that he was the founder of Abheera nation, because his father does it had the name of ‘Raja’ infront of his name. One inscription was laid by a devotee of Lord Buddha named Shakani Vishnu niratha. This inscription revealed that she donated 1000 Karshapanas fund to avail Medical facilities to buddhist monks who lives in Buddhist vihara at the Mountain of Nasik and gave another 500 Karshapanas fund to Govardhana trade guilds, and also this inscription revealed that Eeshwara Sena was the ruler of that regions. Some historians opined that he is the founder of Kalachuri saka started from 49 A.D. But the fact was still unknown. Not only that, but we don’t know the details about his kingdom’s expansion and the kings who succeed him. But the sources are saying that their kingdom has been spreaded upto Kadamba king­dom in the south and upto Ikshvaku kongdom in the East. Chandravally inscription reveals about the dis­putes among kadamba mayura sharma and Abheeras. The Allahabad inscription of Samudragupta also mentioned that the Abheeras be defeated with Samudragupta and also Nagaijunakonda inscription reveals that the Abheeras came to Nagaijuna konda. One inscription mentioned that a person called Sivasena, who was the chief of Army of Vasishtaputra Vasusena of Abheera built a temple of Ashtabhuja swami in the period of his Lord’s (king’s) 13th year of reulership. This inscription explains that the setting up of an idol of Ashtabhuja swami on setagiri in Nagaijuna konda was held in the presence of the king Saka Rudradaman of Ujjain, the king Yavaria of Sanjayapura and the king Vishnu rudrasivananda of Vanavasa. Here one doubt arises that it might be the king Vasishtiputra vasusena of Abheera conquered and ruled the ikshvaku kingdom as per this inscription. One thing has to be Researed that Abheeras ruled Ikshvaku kingdom ever before that Pallavas occupy the kingdom of Ikshvakus. By this inscrip­tion we can clarify that Vijayapuri had the connec­tion with Abheeras and also we can clearly say that Abheeras ruled the Telangana region contemporary to Ikshvakus. Vakatakas occupied the regions of Maharashtra, Telangana by vanishing the Abheeras during the last phase of 4th century. 2.From whom the Abheeras acquired Maharashtra and Telangana regions? 8.The inscription which reveals the disputes among Abheeras and Kadamba mayura Sharma? 1.Name the dynasty which ruled contempo­rary to Abheeras in Deccan? 2.Name the Manuscript which mentioned Abheeras and which grouped them into Sudras? 1.Kumara Sambhavam 2.VIkramanka deva Charitra . 3.How many members of Abheeras were ruled 67 years after Satavahanas accord­ing to Mythological literary works? 4.Name the only king of Abheeras who men­tioned in inscriptions related to Abheeras? 5.Name the devotee of Buddha who donated 1000 karshapanas to buddhist monks in vihara at Nagarjuna konda during the reign of Abheeras? 6.Name the contemporary king of saka who participated in the ceremony of setting up of idol of Ashtabhuja swami on setagiri in Nagaijuna konda?